It depends on your computer. On mine, I saw about 2ms per face for 68 landmarks. Brian, you need to use a face detector before using the shape predictor. The shape predictor will always fit the shape (a face in this case) the best it can. In your case it happened to be in someone's lap. You have to give a pretty good bounding box for the detection and the shape predictor will fit the pose. where is the python tutorial code? I am running the webcam_face_pose_ex code, but for me it runs very slow, During compilation in cmake i have enabled DUSE_SSE2_INSTRUCTIONS=ON, DUSE_SSE4_INSTRUCTIONS=ON, DUSE_AVX_INSTRUCTIONS=ON. I used dlib 18.12 to train landmark detection model with Helen Dataset successfully, but if I replace the data with 80,000+ images, I got an incorrect value -1.#IND of mean training err. Is there any limitations for the size of training dataset? Could you give me some suggestions to solve this problem? There is no limit in the software. You can use as big a dataset as you want so long as your machine has enough RAM to load it. You probably have something wrong with your data. Maybe it has erroneous values in it or you didn't load it correctly. I can't say. Zhang, what data set are you using that has 80,000 images? Hi,Stephen Moore. The data is collected by our lab's students. With the data you provided ( http://dlib.net/files/data/), I trained a model and tested it with a mean err 0.0553159, which is worse than the model you provided ( mean err 0.0356526). During the training, all parameters were set to default value except setting cascade depth to 15. Why can't I reproduce your model? Is there anything else need to be considered? Hi, Stephen Moore. I'm afraid that I can't send the dataset to you directly, because it's not open currently. How are you testing it? The model that comes with dlib was trained on the entire dataset. So you can't check how good it is by running the test portion of that dataset. You would need to check it against something else. I use labels_ibug_300W_train.xml to train model and labels_ibug_300W_test.xml to test. Should I use all images (included in labels_ibug_300W.xml) to train? Recently I read the paper "One Millisecond Face Alignment with an Ensemble of Regression Trees". I want to try to reproduce the paper's results, but I failed. During the first training, I use the data included in file "labels_ibug_300W_train.xml" as trainset, and I test my model and Dlib's in the dataset included in file "labels_ibug_300W_test.xml". My model's mean err is 0.0553159, Dlib is 0.0356526. In the second training, I use all of the data included in file "labels_ibug_300W.xml" as trainset, and I test my new model again. Its mean err is 0.0398477 which is close to Dlib's but not exactly the same. Both of the two training sections, I use the default value for all parameters except the cascade depth is 15. I'm wondering why I can't train a model same as Dlib's with the same parameter settings and data? I don't remember the exact parameter settings I used to create the model. They were similar to the defaults but I may have tweaked something. It was long ago so I don't recall the exact settings (should have written them down). So you will just have to experiment with it yourself and see what you can get. Thanks a lot ! I will try different parameter settings! Hello Davis, very interesting blog, and the application, is there a way to know the orientation of the face? like fitting a plane to the nose and get the plane´s normal vector or something like that with dlib? i wait for your answer, many thanks! Unfortunately, that's not currently a feature of dlib. And I used AVX instructions. Well,my desktop's CPU is core i7 and the picture is 640*480 captured by web camera I set AVX instruction directly in Viusal Studio. .I didn't use CMake to compile.I will have a try. Thanks alot for the wonderful code. Could you please give some detail about the bounding box detector used in the implementation. this is a very nice library. thanks for making it available to us ! so far i have only used the face detection and it works great. is there a way to get age and track IDs for each face? or would it be better to use my own point tracker that keeps track of positions, age, labels etc? There isn't any age or face recognition tool in dlib. Could you also tell us about the HOG paper used for face detection. I'm also interesting in using facial landmarks detector within mobile app. Have you obtained decreased trained model? What is its size and accuracy? May be anyone else is researching in this direction? The trained model provided by Davis is very nice. Thank you, Davis! But it's very big (90Mb). I will be very thankful for any information or comments. By the way I used Train Shape Predictor example to train the images, also I configurated double interocular_distance function for the range covered by the eyes, I used too the default parameters in the constructor. Do you know if there is something else to configure to get better results? It's strange that one of the images used for training failed. i want to extract the eye and mouth coordinate. 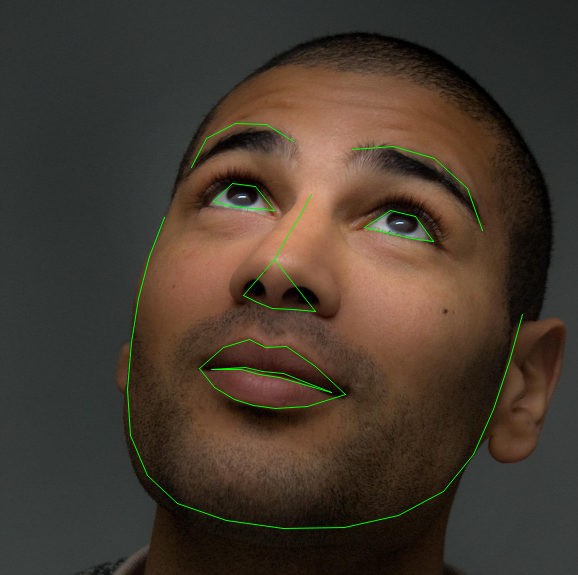 each face's features are described by a range of points that are stored in .part list of each full_object_detection variable. my code is wrapping dlib for openframeworks, so might not be straight up c++. but should give you a good idea on how to make this to work. But i didn't realy understand the code. can you please give me some documentation to help me understand this. And what is the range for each point of the face. I try to download the ibug 300W large face landmark datase from http://dlib.net/files/data/ibug_300W_large_face_landmark_dataset.tar.gz,but it can't be downloaded, as well as from the ibug website. could you send a copy of it to me, please? My email address is adnewer@gmail.com. Why did you use "unsigned long" to store the indexes of "split_feature" and the "anchor_idx" values? Using "unsigned short" would be valid as well? How can you get an XML file for the 68 landmarks dlib predicts for each image? As far as my understanding of uniform LBP, the computed value of x as in lbp.h will consist of values in the range 0 to 58 if 59-bin histogram is considered. I just want to know how these values have been arranged in this manner. What is the logic behind this sort of arrangement of values. Give me some reference where I could understand the functionality of the above code logic. And I mesure the execution time with omp_get_wtime. I comment all cout and window visualization and also pyramid_up(img)(because actually I need to detect only one and the biggest face). The image size is 320*240 and it takes 3 seconds. I use visual studio 2010 in release with optimisation. Enable Enhanced Instruction Set is Streaming SIMD Extensions(/arch:SSE)(/arch:SSE). Can you give some instruction in order that it works faster and in milliseconds ? The goal to use in web and mobile applications. Thanks to any provided help. Sounds like it's not really in release mode. No, I am in release win32 (I do not see the another option to be in x64). I add the screenshots and you can verify by link. After perfoming those instructions, it compiles but how I mentionned it works in 3 seconds. In debug it works very slow (64 seconds per image. PS : Pascal and me, we work together. I think I understand why it is slowly. I do not have the option to optimize until SSE4 or AVX. Finally, I use SSE2. -It is possible to use in mobile/web application library in order that it works in real time ? I am not familar with optimization settings and so on, that is why it is interesting how much restrictions there are. - This file shape_predictor_68_face_landmarks.dat weights 95 Mb. I need just face+landmark detection, this file, does it not contain redundant information ? It is possible to regenerate this file ? but need to have x and y separately to continue my work HELLLP PLEASE !! did you try round(shape.part(38).x()) and round(shape.part(38).y())? I think it should return you the correct x and y values of the point. Thank you for this implementation, it works fine! Have you created a .dat file for the 194 landwarks that are mentioned in Kazemi's and Sullivan's paper? Or do you know where I could find such a file in order to detect more than 68 landmarks? I don't have any other .dat files. For the 194 landmarks you will have to train the model yourself I'm afraid. We have a .dat file for 194 points (the model used in Kazemi's paper). It is 183 Mo. I encountered a strange error- whenever I'm including #include < dlib/gui_widgets.h > to my projects and declaring a variable (for example dlib::image_window win) following errors appear: 'DLIB_NO_GUI_SUPPORT is defined so you can't use the GUI code. Turn DLIB_NO_GUI_SUPPORT off if you want to use it.' and 'Also make sure you have libx11-dev installed on your system' (from guy_core_kernel_2.h). I was searching and found some suggestions that the cmake of dlib could fail- but I really doubt so, I'm already doing a detection of landmarks. The reason why I'm trying to include and declare one of the widgets is displaying values on the screen (there is no equivalent of opencv putText, is there?. 1. How to get shape_predictor_194_face_landmarks.dat ? any links to download directly ? 2. Also do we need to edit any field in dlib face landmark project to inform whether the dat is for 68 landmarks or for 194? I see the procedure to generate the dat file using helan images gets stuck with non availability of xmls requested by dlib project (train_shape_predictor_ex). >> http://stackoverflow.com/questions/36711905/dlib-train-shape-predictor-ex-cpp?answertab=votes#tab-top has some puzzled answer. I don't have a model file for that dataset, so you will need to train your own. You don't need to edit any dlib code. The example programs and documentation give full details of how to use dlib. I tried to train a model of 68 landmarks with iBUG-300W dataset as you did. However there are only 535 images can detected correctly and I used the train_shape_predictor_ex with default parameters. However the mean_test_error is 0.07 and yours is 0.04 on the same test dataset. Can you provide some details of training process? But I got the "sp.dat" is 3.8 GB, what data I used is "http://dlib.net/files/data/ibug_300W_large_face_landmark_dataset.tar.gz" . Could you tell me why the "sp.dat" is so big and hope you can understand my pool english. It's because you set the tree depth to 10.
when you trained model, these are you set? No, if I recall correctly, I used the default settings except the cascade depth was set to 15.
but I got a "sp.dat" big as 8.7GB,it is driving me mad. hope you can tell me that's why. When I used train_shape_predictor example, I printed the landmarks read from the original test xml file by load_image_dataset function one by one and found that the orders of some landmarks are not the same as what written in the xml file. So I read your code and found nothing about this phenomenon. Do you have some hints about this? Note that it says: "parts_list is in lexicographic sorted order." However I just put in three parameters in the function as the example did. And I printed both the landmarks' value and index in the test data set. Some points for example, some landmarks on the face edge, appeared after the eyes which I believed should be the first 41 points in the XML file(I used 194 points to train). I couldn't see any orders on these points. And that gave me a huge trouble on testing the accuracy of the model because of the wrong index of eyes' landmarks. I've found the reason and solved the problem. It was because the part name in my xml file was, for example "1", rather than "001". I am trying to build an app which does realtime make up to a webcam detected face. Like, https://www.youtube.com/watch?v=C6hI65ZMSxM. I am trying to extract different facial features. Which code should I start changing and what changes should I make. I've been trying to train a model using your example program and dataset with your 68 point markup but I have trimmed 60 of the 68 points and kept the remaining 8 that I need. Unfortunately, once training completes I receive -nan for testing and training error. The model that is saved is invalid as well (as I would expect from the -nans) I've tried training with the original unedited 68 point xml files and training completes successfully with valid error and a valid model. The xml file opens appropriately in a viewer and the parts are all in the correct spot, as is the bounding box. If you have any ideas on what could be causing the -nan, or where I should be looking, let me know. I tested landmark detection on embedded platform(linux-arm), however speed is very slow, can you please tell me to how to optimize for arm architecture by using simd extensions ( similar to SSE2,SSE4 and AVX in case of x86 processors). I am using face_landmark_detection_ex.cpp to detect and then extract cropped faces. But I need the faces in their original width and height. Unfortunately this code gives face with same width and height (I can change it to crop faces with the height and width of the rectangles returned from the detection function, however the width and height are same). What I need is the real height and width of the face (presumably height is greater than width of an usual face). Is there any way I can do it with this library or any other open source library? I'm not sure I understand exactly what you want to do, but you can definitely crop out images any way you like with dlib. we want to use the landmark detection on a DSP with no floating support. Is that feasible? I imagine the algorithm would work fine in fixed point arithmetic. Thanks for your feedback. Do you know about any ports to plain C ? can you give me an idea what the smallest size for the pose model might be in order to produce meaningful results? Our embedded system has severe restrictions on memory footprint and the 95MB for the data are far too much. We have only 128 MB RAM for the complete system. The number of landmarks would have to be restricted to lets say 16 and the image size to VGA resolution. Before I go through a training process I wanted to get you take on this. The size of the model is linear in the number of points. So you can reduce the size a lot by dropping landmarks. Other parameters effect the size as well. You can definitely make a small model. Hi Davis, I looked into training for a smaller number of landmarks but could not find the anything in the code where to set the number of points being trained. Do I have to edit the training data and remove all landmarks which are not wanted, or is there a better way of doing this? I was shooting for < 10 landmarks per face. You have to make a dataset that has whatever landmarks you want. There isn't some kind of hard coded thing in dlib that assumes you have a particular set of landmarks. Are you familiar with the CMU OpenFace project. To my knowledge they are using dlib's face detector, however a different facial landmark detector. Do you know why? I know about openface. It says right on the front of their web page that openface uses dlib's facial landmark detector. You are right. The pose_model is really fast, but I am struggling with the facial detector yielding the bounding boxes. Is there a way to speed it up? Restrict facial size, number of faces, resolution of the input image? Any ideas are appreciated. can I use imglab to remove landmarks ( i did try --rmlabel without success) and renumber the remaining ones? Or do I have to write a program that does the modifications to the .xml files? just to give you some feedback: I trained the landmark detector on the ibug training set for only 10 landmarks and reduced the file size of the sp. dat file down to 2.8 MB. Now I have to remove the floating point variables in the detector and the pose_model for implementation on a fixed point DSP. How would i know which of land marks belongs to which position on face. e.g land mark number 5 belongs to eye or lips etc ? l wanna to use ASM for features extraction then use SVM in classification to make recognition. There is a problem with tremoring of predicted shape in realtime video. Can you suggest which parameters of training helps reduce this effect? Then you should read the code (http://dlib.net/faq.html#Whereisthedocumentationforobjectfunction) and the referenced paper in this blog post. Then you will understand. In HELEN database training images there are many landmarks (annotations provided by HELEN) off the box detected and generated by DLIB's detector. Is this an issue for training ? I've trained shape predictor with your data (6666 train + 1008 test images). Parameter values are defaults+cascade_depth = 15. Results are : mean training error: 0.0369526,mean testing error: 0.0555288,sp size : 97,302. Are those results normal ? Just started using dlib, and it is simply wonderful! Thanks for putting this together. I am interested in an application where a single keypoint of a given image is to be localized very accurately. Do you think I should go with a shape predictor with only 1 point or rather try to translate the case to a detection problem? If it's just one point I would go with a normal detector. However, the specific details of the problem can be important and for some things you need specialized solutions. Thanks again for such a great library! I am training a shape detector for human face, as I need additional landmarks on ear. Training for total of 12 landmarks. After creating sp.dat from training, I am using it to detect landmarks on images. However, 5 landmarks are always off; rest all aligns up perfectly. Can you give some pointers on how to fix it? First of all i really appreciate your efforts in developing dlib and helping others by replying almost everyone. I am trying to use dlib for real time face recognition and it is a bit slow. thus i compiled it after turning avx instructions on..this speedened the code but the accuracy has fallen drastically.Can you tell why this is so. Thanks for your amazing job. I was wondering why is the .dat file provided with the example is so big ? How can I make it smaller ? Training the shape predictor on less landmarks and/or images can reduce its size ? Any other suggestions ? The size is linear in the number of landmarks. So if you retrain with fewer landmarks it will be smaller. It is also linear in the size of a number of other training parameters. The dlib API documents all the parameters, which area also described in great detail in the original Kazemi paper. Thanks again for letting everyone use this great library. I noticed that the shape_predictor has an option to return some kind of feature vector. How do I interpret this feature vector? I understand that it contains 15 times 500 values, because the landmark detector has a cascade of 15 forests with 500 threes each. But I do not completely understand what these 7500 values represent. Do you think that it would be possible to use this feature vector to get some kind of quality measure of the landmark fit (or check if the input image contained a face)? It might give you a quality measure, it's tough to say. You can certainly use it to decide if a point is occluded or something similar. Maybe to know if a face is present. But probably not much about landmark fit since if it had excess information about landmark fit it probably would have fit the landmark better in the first place. But you never know until you try. Could you give me a hint on how to use it for detecting occluded landmarks? Use a linear SVM to train a classifier. Is there any additional issue that should be excluded like the usage of iBUG 300-W dataset in training for commercial use? Hi guys Iam working an project facedetection nd eye blinking. Face detection is perfectly fine but eyes blinking is not working perfectly through video stream.which method is helpful for me till now iam used dlib. Any one having sample source please mail me ..